Two stories in one! Chuck and Walter's story continues, while "Eli's Game" pulls back more on life among the dysfunctional family on board Destiny. Two stories in one! While Rush and Young face their strained relationship on board Destiny, in Atlantis Chuck and Walter have their own story to tell. Janus and the DV aliens are on the brink of achieving their ultimate victory. Only the crew of Atlantis stands in their way and the utter destruction of everything. The Atlantis team is faced with the final agenda of the rogue Ancient, Janus, as his machinations leave the galaxy teetering on the brink of destruction! The Atlantis team struggles against the out-of-control Ancient Janus and his alien army, with the fate of two galaxies on the line! Two stories in one! The Atlantis team finds technology that threatens the city, while on Destiny Camille Wray prepares for an uncertain future. Janus' plans are revealed and the Atlantis team must find a way to stop this mad genius before he unleashes a terrifying wave of destruction. Having resettled the Ancient city of Atlantis back in the Pegasus Galaxy, Colonel Sheppard and his team discover the diabolical truth behind Janus' master plan. Reeling from an alien attack on the city, the Atlantis team must face a new threat in the form of one of the Ancients' greatest scientists. The Atlantis team squares off with a new alien threat that is emerging, while Janus continues his plan to wipe out the Wraith once and for all. 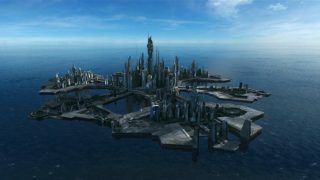 Janus forces Atlantis to evacuate from Earth, throwing the city into chaos and setting into motion a deadly chain of events. Atlantis's presence on Earth poses a new threat to the planet, as a threat from the past plots a devastating attack. A new threat rises to challenge the crew and stop them from returning the city of Atlantis to its rightful place. A startling discovery sends the Atlantis team in search of a new Stargate system, and reveals that the horrors of the Pegasus Galaxy are not far away. Dynamite Entertainment's special preview book was to include three short stories intended to tease new lines of SG-1 and Atlantis comics. Teyla and Ford launch a dangerous mission to rescue Sheppard from the Wraith laboratory. But will their actions doom an entire world? Sheppard finds himself a prisoner inside a Wraith laboratory, while sabotage back on Atlantis may thwart their rescue mission before it has begun. A backwater planet's bizarre deal with the Wraith may offer Major John Sheppard a chance at redemption ... or lead to the utter destruction of the Atlantis team. The Atlantis team encounters the Karrans, a primitive race that has made a bizarre deal with the Wraith.